Contemporary beautiful modern bath accessories. These accessories are thick durable acrylic. Available in Red, Purple and Anthracite Grey. A great coordinated item with select bath rugs and shower curtains from our collection. 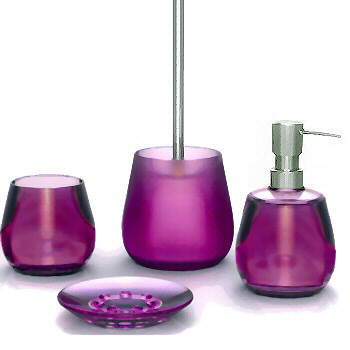 The size options include a tumbler, soap dish, soap or lotion dispenser and toilet brush set. Round bowl design with chrome accents.